Oatmeal Chocolate Chip Cookies - The Mrs. & Co. I don’t know about you, but I have a sweet tooth. Like major sweet tooth and when I find something I like, I like it a lot and want to have it all the time! As a kid my mom used to always make oatmeal chocolate chip cookies and I’ve loved them since then. I’ve always been a fan of oatmeal, which is why I think I love them so much. This recipe is seriously the best too. The cookies come out warm and gooey and go perfect with a glass of milk. Just ask my daughter. She’s the reason I can’t eat them in front of her. She will end up finishing them for me. Mommy doesn’t like to share her cookies. Enjoy this easy recipe and make some delicious cookies. I promise you will fall in love! In a mixing bowl, combine flour, baking powder, cinnamon, and salt. Set aside. Add eggs and beat on high for 1 minute. Then add vanilla. Slowly add in flour mixture and mix on low. 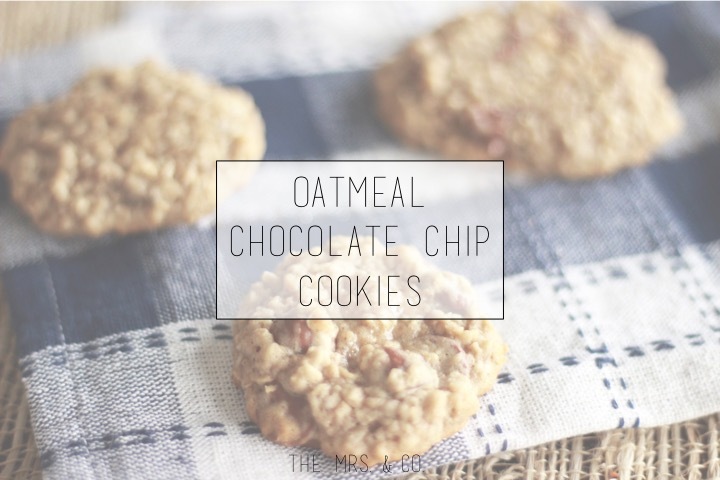 Add in oatmeal and chocolate chips. Keep the mixer on low. Mix until combined. Chill the dough for 30 minutes-1 hour. This step is not necessary if you are crunched for time. Put parchment paper (I use a silpat) on your cookie sheet and use a cookie scoop to place the dough about 2 inches apart. I fit 12 cookies per sheet. As for baking time you have to know your oven. My oven cooks fast (gas oven) so I cook the cookies for 8 minutes. You want the cookies to be light brown around the edges and gooey in the middle. They will continue to cook when you take them out of the oven. Play around with your cooking times for each batch so that the next time you make them, you’ll know for certain the perfect cooking time. If you don’t like chocolate chips, you can add raisins or nuts. Do whatever tickles your fancy! If you like dryer cookies, cook longer. If you like gooeyer cookies, cook less. Joelle from Joelle Charming is featuring my recipe on her blog today. Make sure you go check out her blog. I can not wait to try this recipe!!! 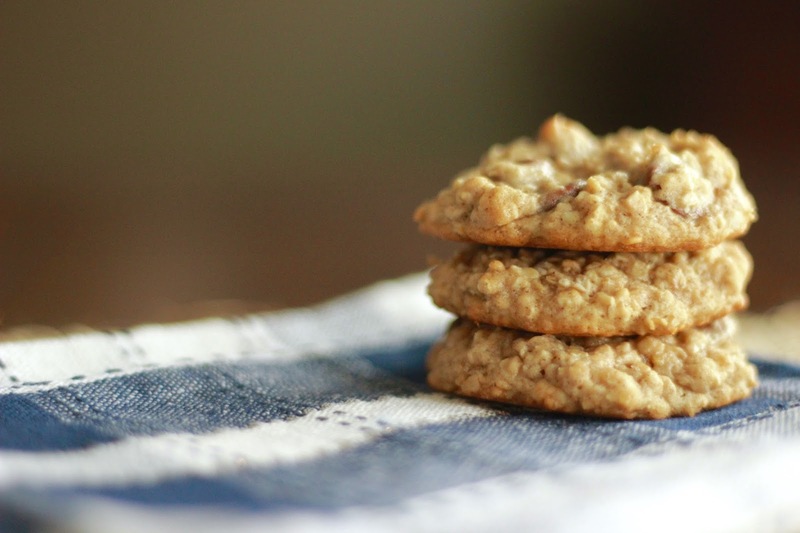 I have not run across an oatmeal cookie recipe I have liked yet so I know this will be perfect!! Thank you for sharing! After printing this out June of 2016 (see above haha) I finally was able to make them this past weekend and they are wonderful!!! My MIL bought me a mixer like 2 years ago and this was the first time I got to use it!! Had to wait til no kiddo was at home. Thank you so much for sharing it!